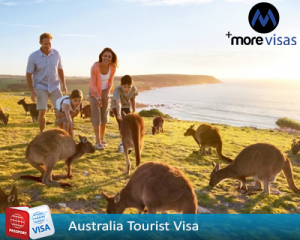 Australia, which is known as “land of Kangaroos”, has a great deal to proffer for travelers. This vibrant, cultured nation is home to enthralling wildlife, historic monuments and sculptures, adventurous destinations, urban prettiness, picturesque beaches and scenic natural attractions. Every year thousands of tourists from across the globe flock to this prosperous nation to enjoy its staggering landscapes, cultural amenities and exotic food offered by the modern restaurants in the country. An overseas tourist planning to visit this lovely continent must obtain Australian tourist visa to make their vacation fruitful. The Australian tourist visa is a short-term entry permit granted by the concerned officials to visit the country for sightseeing, meeting friends and relatives, business works, recreational and social reasons or for other short duration non-work reasons. Most overseas tourists desire to visit and reside in their dream nation for a short period and long duration. In such cases, a foreign applicant can make use of short stay visitor visas or long stay visitor visas that permit an aspirant to stay in the country for three months or more than six months. Apart from the above-mentioned visa options, few overseas applicants also aspire to visit this Kangaroo land for emergency medical treatment. In those cases, an overseas visitor can make use of Short Stay Medical Treatment visa or Long Stay Medical Treatment Visa which is valid for three or more than three months. If you are aspiring to tour to this beautiful tourist destination as a visitor for tourism or business activities, then make use of an Electronic Travel Authority (subclass 601), eVisitor (subclass 651) or Visitor visa (subclass 600) to make your break enjoyable. Out of the aforesaid visa categories, Australian Visitor Visa (subclass 600) is the best option for tourists wishing to reside in the country for a short period. An added advantage of an overseas national visiting their dream country by making use of Australian Visitor Visa (subclass 600) is that he or she is permitted to reside and travel across the nation for more than 90 days without any constraints. If you want to apply this visa, fill out Enquiry Form, so one of our visa expert will get back to you.